Thanks for coming! If you're new here, you'll see an Announcement below explaining how to join our Class of 1969 website. Our Reunion will be held during Memorial Day Weekend, May 24 through 27, with more than 3,000 people expected on the Oberlin College campus. A booklet like the one above has been sent to you. There you'll find a great deal of information, including a preliminary all-campus schedule for the weekend. In addition, we're planning special activities for our 50-year class, as you can see by checking out our Draft Schedule of Events here on this website. There are two ways to sign up for housing, dinners, and entertainment. 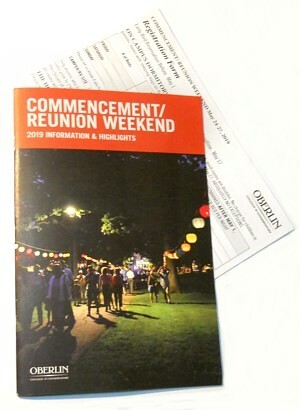 The booklet includes a mail-in form with which to register, but the preferred way is to go to oberlin.edu/reunion and register online. Submitting your reservation requests early is recommended, and you'll get a discount if your payment is received by the end of this month! Also on this website, you can post ideas to the whole class through Discussion Threads on matters like retirement or the College's finances. You can look back in time. And you can swap messages with classmates about shared activities and interests, whether or not you'll be able to return to Oberlin in May. Even after the reunion, we plan for this website to remain active for years as the “memory book” for our 50th reunion. We hope you'll continue to add your comments! If you're new to this website, please go to the First Time Visitors menu item (on the top bar above) to learn about it. Then go to Classmate Profiles and locate your name. (Tip: try a Search for your name, which is faster that scrolling through that long list.) Click on your name and follow the prompts to create your profile. Many of your classmates have already joined, and you can check out their profiles. However, many have not, and you can help us out! Go to Not Yet Joined This Site , where you'll find several of your old friends on the list. If you know how to get in touch with any of them, please do so and ask them to join us here. Once you've registered for the reunion, return to this Class of 1969 website and let your classmates know you'll be coming by responding to our Survey: Will You Attend? (unless you've already done so). We have more than 100 symbols so far. Check out the > Pre-Reunion in Cleveland page to find out who's coming. The dinner on Wednesday evening has been moved to Murano, modern Italian cuisine just a two-minute block from the Drury Hotel. “Ten Thousand Strong” is Oberlin's alma mater. We receive financial support from almost 10,000 loyal alumni. And 1,000 of us will be donating on a single day! That day is April 25 — the Annual Fund's third annual All In for Oberlin. Whenever our school is evaluated by prospective students (and corporations, foundations, and U.S. News & World Report), one factor is the percentage of alumni who donate annually. To boost our participation rate, each of us should give every year if we're able. Even a few dollars. If we reach our goal of 1,000 donors on April 25, for each gift of any size Chris Canavan '84 will donate $100! He's pledged up to $100,000 for this challenge. So on Thursday, April 25, visit go.oberlin.edu/allin and click GIVE NOW. Or call 800-693-3167.